Below you will find links to the latest top news stories, hot tips and tutorials and anything else that is happenin’ within the the Internet industry. The news feeds are updated daily so bookmark this page for future reference. Click here to read all emcompassing Web Devlopment News! Click here to see the new Imagine Vancouver 2010 Olympics Logo! 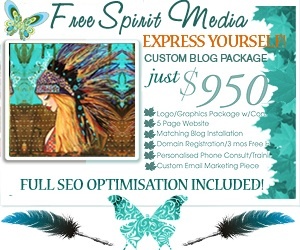 Posted in: All About Clients, Client Relationships, Design Tips, Development, Events, Everything SEO, Hosting, Inspiration, Latest News, News, PHP, Weekly Musings- May 07, 2013 Comments Off on Free Spirit Media Summer Custom Blog Design Package with SEO Optimisation! 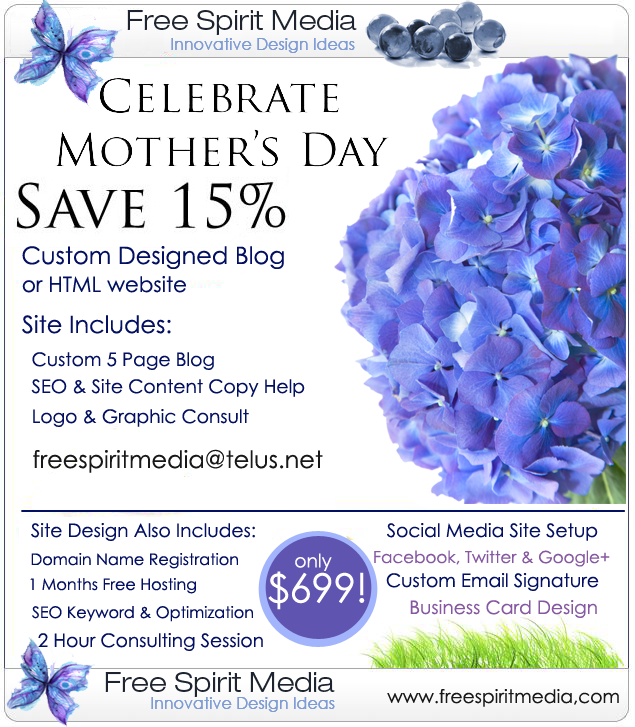 We are having special Mother’s Day Custom Designed Blog/Website Sale! Lots of extras are included which would normally cost 3 times this price. If you know anyone that needs a personal or business site this is a great start-up price! Pass this along if you know anyone looking. This is for new sites only and cut off time is Friday, May 10th 2013 at midnight. ** Sale only on new site design contracts only – should you wish a site upgrade we can discuss other options utilizing a sale price. Posted in: classes, Community, contributors, Events, hackathons, meetups, WordCamps- Jul 13, 2012 Comments Off on Event Organizers Unite! I’m happy to announce the formation of a new official contributor group within the WordPress project for the organizers of in-person events that promote WordPress. Though there are hundreds of people around the globe organizing WordCamps, WordPress meetups, hackathons, free classes and the like, since their “projects” were all happening locally there was never a central hub of activity for these folks. Despite the many informal connections between community organizers, we weren’t taking advantage of the huge existing knowledge base as new organizers stepped up to the plate. If you are the organizer of a local WordCamp, WordPress meetup, etc., head over to http://make.wordpress.org/events/ and introduce yourself so we can include you in the fun! Speaking of meetups, an update on my last post about meetups is long overdue. With around 500 meetup organizers (and/or potential organizers) responding to my last survey, it took much longer than anticipated to review all the responses. We’re working now with meetup.com to issue invitations to join a centralized WordPress Meetup account, so if you filled out the form earlier this year, you should be hearing from them soon. The first wave of existing meetup account transfers (for those who opted in) should happen in the next two weeks, with additional waves every 3 months thereafter (and new groups will be able to be created along the way). The contributor summit that is being planned for the end of October also generated hundreds of responses/nominations, so that review process is still happening, but we should be announcing some basic plans and issuing invitations soon. And finally, it would be impossible to talk about in-person WordPress events without mentioning the upcoming annual WordCamp in San Francisco. As the event that represents the worldwide project as a whole, it’s the perfect time to evaluate where we stand as a project and as a community, to help determine where we go next. If you’re a WordPress user, developer, or in any way a part of our vast and interconnected ecosystem, please take a moment to fill in the 2nd annual WordPress survey. It’s just a couple of questions, and your input would be greatly appreciated. The results of the survey will be announced at WSCF, and a report issued shortly thereafter. * I am also of the firm belief that academic and arts activities should earn varsity letters just like sports teams do — go mathletes! WordPress 3.4 is here and out the door. We’ve dubbed this release “Green” in honor of guitarist Grant Green whose soulful simplicity has kept many of us company during this release. We’ve also put together a busy developer’s field guide to the new APIs in 3.4. 082net, Aaron D. Campbell, Adam Harley, AJ Acevedo, akshayagarwal, Alex Concha, Alex King, Alex Mills (Viper007Bond), ampt, Amy Hendrix, Andrea Rennick, Andrew Nacin, Andrew Ozz, Andrew Ryno, Andy Skelton, Arie Putranto, Austin Matzko, Barry, BenChapman, Ben Huson, Benjamin J. Balter, Bill Erickson, Billy (bananastalktome), Boone Gorges, camiloclc, casben79, Caspie, ceefour, cheald, chellycat, Chelsea Otakan, Chip Bennett, Chris Olbekson, Coen Jacobs, Cristi Burcă, Cyapow, Dan Collis-Puro, Daniel Bachhuber, Daniel Convissor, Daniel Jalkut (Red Sweater), daniloercoli, Daryl Koopersmith, David Gwyer, deltafactory, demetris, Dion Hulse, dllh, Dominik Schilling, Doug Provencio, Drew Jaynes (DrewAPicture), ebababi, edward-mindreantre, emhr, Empireoflight, Eric Andrew Lewis, Eric Mann, Evan Anderson, Evan Solomon, Fred Wu, Fumito Mizuno, Gary Cao, Gary Jones, Gautam, Gennady Kovshenin, George Mamadashvili, George Stephanis, Gustavo Bordoni, hearvox, Helen Hou-Sandi, Hugo Baeta, Ian Stewart, insertvisionhere, Ipstenu, Jacob Chappell, Jane Wells, Japh, jaquers, JarretC, jeremyclarke, Jeremy Felt, Jesper Johansen (Jayjdk), Jiehan Zheng, Joachim Jensen (Intox Studio), Joachim Kudish (jkudish), John Blackbourn (johnbillion), John Ford, John James Jacoby, Jon Cave, Joost de Valk, Jorge Bernal, Joseph Scott, Justin, Justin Givens, Kailey Lampert (trepmal), Kenan Dervisevic, Konstantin Kovshenin, Konstantin Obenland, Kristopher Lagraff, Kurt Payne, Lance Willett, Lardjo, Lee Willis (leewillis77), linuxologos, Lutz Schroer, Mantas Malcius, Marcus, Mark Jaquith, Marko Heijnen, Mark Rowatt Anderson, Matias Ventura, Matt Martz, mattonomics, Matt Thomas, Matt Wiebe, MattyRob, Max Cutler, Mert Yazicioglu, mgolawala, Michael Adams (mdawaffe), Michael Beckwith, Michael Fields, Mike Schinkel, Mike Schroder, Mike Toppa, Milan Dinic, mitcho (Michael Yoshitaka Erlewine), Mohammad Jangda, mrtorrent, Name.ly, Naoko McCracken, Nashwan Doaqan, Niall Kennedy, Nikolay Yordanov, norocketsurgeon, npetetin, Nuno Morgadinho, Olivier Collet, Paul Biron, pavelevap, Pete Mall, Peter Westwood, pishmishy, Prasath Nadarajah, prettyboymp, Ptah Dunbar, pw201, Rami Yushuvaev, Rarst, RENAUT, Reuben Gunday, Roscius, Ross Hanney, russellwwest, Ryan Boren, Ryan Duff, Ryan McCue, Safirul Alredha, Samir Shah, Samuel “Otto” Wood, Seisuke Kuraishi, Sergey Biryukov, Simon Wheatley, sirzooro, sksmatt, Stas Sușkov, Stephane Daury (stephdau), tamlyn, Thomas Griffin, Thorsten Ott, TobiasBg, Tom Auger, Toni Viemero, transom, Ulrich Sossou, Utkarsh Kukreti, Wojtek Szkutnik, wonderslug, Xavier Borderie, Yoav Farhi, Zach “The Z Man” Abernathy, Zack Tollman, Ze Fontainhas, and zx2c4. 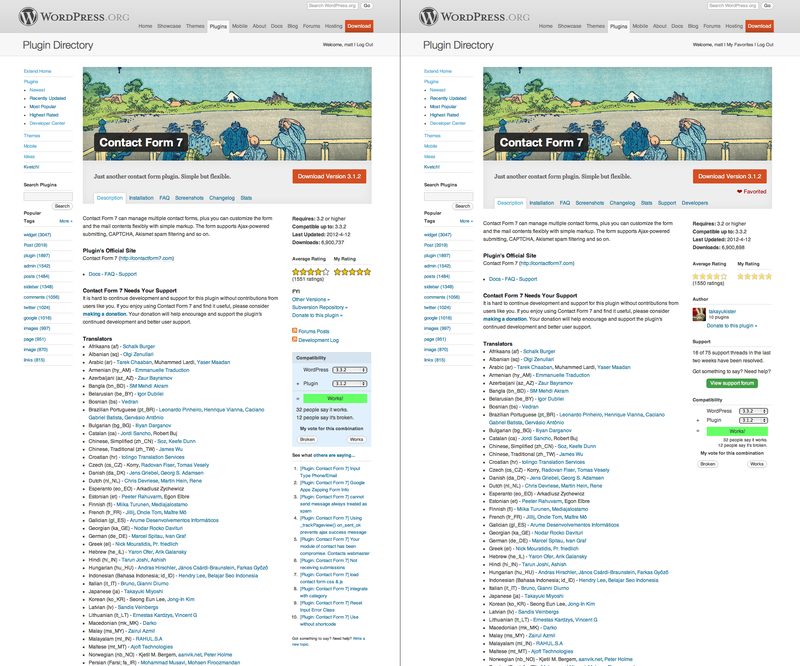 The second release candidate for WordPress 3.4 is now available. Since RC1, we’ve made a few dozen final changes. Our goal is to release WordPress 3.4 early next week, so plugin and theme authors, this is likely your last chance to test your plugins and themes to find any compatibility issues before the final release. We’ve published some resources on the development blog to help you prepare. If you think you’ve found a bug, you can post to the Alpha/Beta area in the support forums. Or, if you’re comfortable writing a reproducible bug report, file one on WordPress Trac. Known issues that crop up will be listed here, but we’re hoping for a quiet few days so we can get some great features into your hands next week! To test WordPress 3.4, try the WordPress Beta Tester plugin (you’ll want “bleeding edge nightlies”). Or you can download the release candidate here (zip). Be sure to visit → About for an updated list of features and under-the-hood changes. An RC comes after the beta period and before final release. We think we’re done, but with millions of users and thousands of plugins and themes, it’s possible we’ve missed something. So if you haven’t tested WordPress 3.4 yet, now is the time! Please though, not on your live site unless you’re adventurous. If you are testing the release candidate and think you’ve found a bug, please post to the Alpha/Beta area in the support forums. If any known issues crop up, you’ll be able to find them here. Our first focus was around improving the discussion and support around plugins. You’ll now notice that threads about a plugin are pulled directly into a “support” tab on the plugin page — each plugin has its own forum. We’ve made authors much more prominent and with bigger Gravatars and better placement, so you can get a sense of who made the plugin you’re using. And finally to show how active and well-supported a plugin is, you can see ”16 of 75 support threads in the last two weeks have been resolved.” Finally, if you’re logged in you get access to the new “favorites” feature that lets you mark the plugins you use the most so you can share them on your profile page and find them quickly later. We soft-launched favorites a few days ago and there have already been 2,000 saved! If you’re a plugin author, we’ve started with a short threshold (2 weeks) for the resolved stats so it’s easy to catch up and stay on top of it. (It’ll eventually go to two months.) You also now have the ability to set stickies on your plugin forum to put FAQs or important information at the top, and of course any person you put as a committer on the plugin will have moderation access. People on the forum tag will see your custom header and links to the other resources attached to your plugin. “Plugin headers” or those cool graphics you see at the top of plugin pages have really taken off, there are over 1,600 active now. You can now subscribe to get an email whenever a commit is made to a plugin repository even if it isn’t yours. There is no better way to follow the development of your favorite plugins. There’s nothing like the smell of fresh changesets in the morning. Behind the scenes, we’ve dramatically ramped up proactive scanning of the entire repository to help authors fix security and other problems they might not even know about yet. The quality level of the repo has gone way, way up.